A look at meetings-related announcements from Google, Logitech, Prysm, Nureva, and Crestron. So much of our working lives revolve around meetings -- there's just no escaping them. Luckily, communications technology vendors are hard at work rolling out enhancements, developing new integrations, and launching new capabilities to improve the way we meet, collaborate, and get things done. Here's a look at five meetings-related developments that caught our eye this week. Google announced several updates to its enterprise hardware portfolio. To start, Google is taking on larger meeting rooms, enhancing the Hangouts Meet conference kit introduced last March complete with a touchscreen controller, speaker mic, ASUS Chromebox, and a 4K sensor camera. It has added a new room kit option that comes with a Logitech PTZ Pro 2 camera, meant for meetings with up to 20 people. The camera has 10x optical zoom, letting users zoom in, pan, and tilt to focus on certain participants. Additionally, Google is offering a standalone Meet speaker mic to provide clearer audio in larger rooms; up to five of the standalone mics can be chained together. Google further noted it has expanded Hangouts Meet hardware offering to the Netherlands and Denmark, making the solution available in 14 countries total. In addition, the company said it is expanding availability of Jamboard, its intelligent digital whiteboard, beyond North America and the U.K. to Europe starting next month. And speaking of Jamboard, Google has added an artificial intelligence-powered feature, called AutoDraw, that automatically detects what a user is sketching and pairs that with images to help make ideas more visual. In addition, the company said, the Jamboard app is now a core service in G Suite. While Logitech has made its way into Google's enterprise hardware portfolio with that Meet camera option mentioned above, the company is busy on other partnership fronts too. 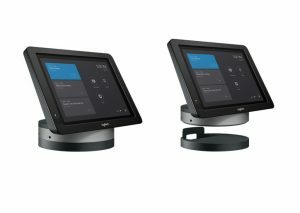 Logitech has announced an upgrade accessory for its SmartDock, released a year ago in collaboration with Microsoft as a control center for Skype Room Systems. Now Logitech is offering a SmartDock Flex plus expansion kit, which conquers two problems reported by SmartDock customers: cabling inflexibility and the inability to use conference rooms for calls with systems other than Skype for Business, Joan Vandermate, head of marketing for Logitech's Collaboration Business Unit, told me in a briefing. The company's first version of the product consolidated separate cables for power, data, USB, and dual HDMI into one proprietary five-meter cable. But this approach caused the cable to be bulky and inflexible, difficult to get around corners and such. With the SmartDock Flex, Logitech has consolidated these cables into a CAT6 cable, which can more easily pass through conduit, Vandermate said. Also with SmartDock Flex, users can now use their Skype Room Systems for meetings on other applications. SmartDock Flex adds passthrough access for local projection as well as participation in external meetings that use BlueJeans, Cisco WebEx, Zoom, or almost any other meeting or webinar service. Users can add SmartDock Flex, which will be available for purchase in the next few weeks, to an existing SmartDock console for $799. Prysm, known for its immersive collaboration systems, announced the availability of native mobile and desktop apps for iPhones and Microsoft Windows 10-based PCs. From the Prysm for iPhone app, for iPhone 6 and up, users can log into Prysm-enabled displays and engage in Prysm projects; add files, websites, and other apps to workspaces; and view project files up close during collaboration, the company said. Prysm for Desktop allows users to connect to visual workspaces, collaborate, and share desktop or Web applications as well as files, notes, and sketches. While the Prsym desktop app is only available for Microsoft Windows 10 devices today, the company said it plans to expand to other devices later this year. The apps are free to download from the Windows 10 and Apple app stores, but a subscription to Prysm's digital workplace platform is required. 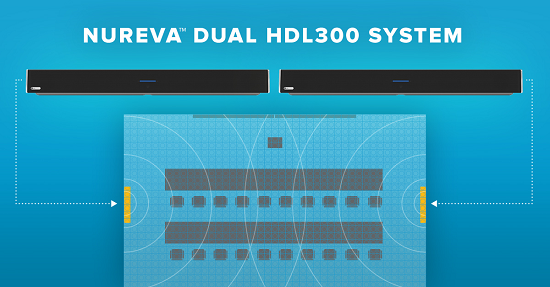 Collaboration solutions provider Nureva announced a second model in its HDL300 audio conferencing system product line launched mid-2017. Dual HDL300, designed for large meeting spaces like briefing centers and training rooms, incorporates the company's Microphone Mist technology, which "fills a room with up to 16,384 virtual microphones that pick up sound throughout the entire space, as the image below shows. The system uses algorithms to process and integrate sound coming from both sets of virtual microphones, and combines this with echo cancellation, position-based automatic gain control, and sound masking. On the management front, Crestron unveiled XiO Cloud, a cloud-based platform that allows centralized configuration, monitoring, management, and control of Crestron products deployed enterprise-wide. XiO Cloud supports management of products including Crestron Mercury for UC and collaboration; 3-Series Control Systems and DigitalMedia products for AV and building management; and TSW touchscreens. Enterprise IT managers can leverage XiO Cloud to deploy and manage thousands of devices using a simple drag-and-drop functionality, the company said. Admins can name, configure, and organize devices; push software updates to one or all devices; activate, transfer, or remove device licenses; and view a searchable activity log and live statuses. For meeting participants, the company debuted its AirBoard PoE technology, which allows digital whiteboard content to display on user devices. This is meant to solve line-of-sight problems in which meeting participants -- particularly remote attendees -- can't see presentation whiteboards. Learn more aboutVideo Collaboration & A/V at Enterprise Connect 2018, March 12 to 15, in Orlando, Fla. Register now using the code NOJITTER to save an additional $200 off the Early Bird Pricing or get a free Expo Plus pass.